I've talked about this a bit for a single issue, so I thought I'd do a brief review of it- the 'it' being James Stokoe's Marvel 100th Anniversary special issue, an Avengers #1, which he drew, lettered, coloured, wrote and generally gave birth to. 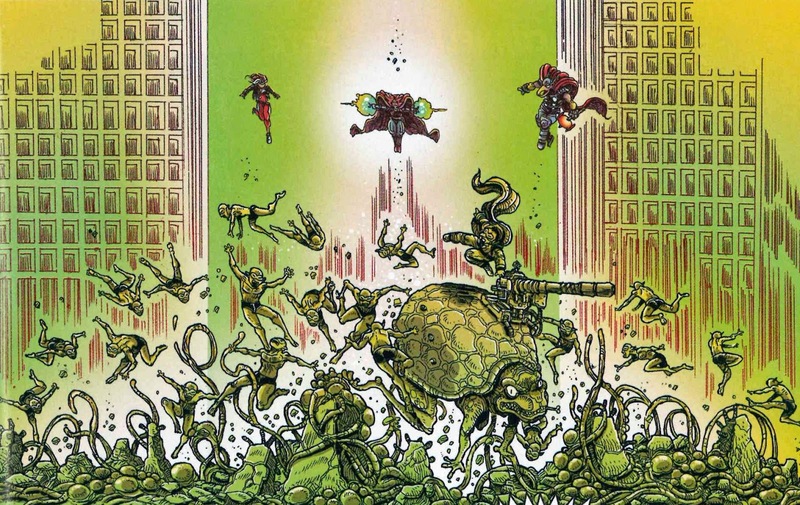 Also, the chance to have some of that Stokoe good stuff prettying up my blog is too much for me to pass up. My familiarity with the characters -Dr Strange, Rogue, Beta Ray Bill- and universe here is nil (or very superficial, in that I know of their names and have seen some of them in films), but that doesn't affect the reading; this is accessible to all (I'm sure there are references that can be appreciated by long-term fans). It's a contained story, that quickly establishes the setting and scenario via a great 'previously on...' introductory page (you can see, and probably read, it here): there's been a huge war with the Badoon Empire, which has left Earth barely victorious: poisonous and polluted, and thanks to the deployment of of the Great terror Weapon, the whole American continent has been transported to the negative zone. A devastated Captain America's gone in search of his home-land, and the Avengers are scattered and displaced, setting base in Kuala Lumpur, Malaysia, which is where we open. It's barely been a week since the war ended, and Dr Strange, Rouge, and Beta Ray Bill are still doing clean-up rounds, patrolling the skies sat atop a flying pyramid-shaped craft: the Quinjet. 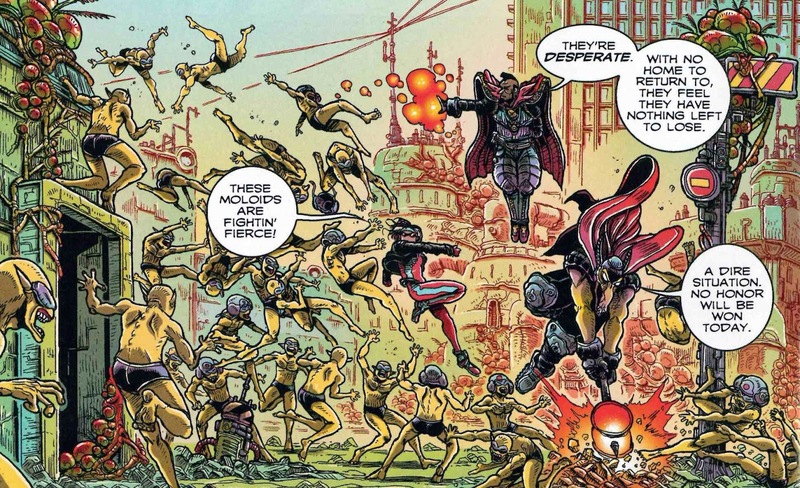 On the ground, a couple of guys engaged in the clean-up effort spot the jet and argue about the importance of the Avengers, a discussion that's left hanging when the stumble upon a threat of a different kind- the moloids! Having lost their homeland, Subterranea, in the wars, the desperate moloids are bent on taking Earth for their own- the question is whether Strange, Rogue, and Bill will be enough to stop them. I had such a bad day on Wednesday and this comic was the only little ray of light in it. It serves as an example of what Stokoe can do, even in as condensed a story as this. He makes the right choice in keeping it relatively simple (there's a lot of detail in the back-matter and placing of context): no great group of characters to get to grips with, limited to 3-with guest appearance by Tony Stark, and the scenario in which they find themselves is equally straightforward- these dudes fighting those dudes. I really liked that pared back approach, a more subdued Stokoe in terms of writing and things going on; it allows the reader to take in the art more and boy, is it gorgeous- the lines finer than ever. I feel like I've not seen Stokoe use a block red in his work often- always a lot of pink and gradients, and the usage of it pops here, in Rogues jumpsuit and Strange and Bill's capes, binding the three together. 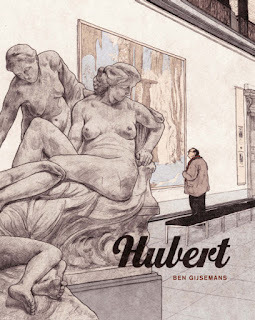 Above all, I appreciated the positivity of the narrative and resolution: it's fun and serious- not in the sense of grittiness/darkness, but of heft and some depth, respecting the story. Stokoe's a complete cartoonist in his ability to execute his vision proficiently- the real deal, and I feel lucky to be around while he's doing his thing. Pick this up if you haven't already. 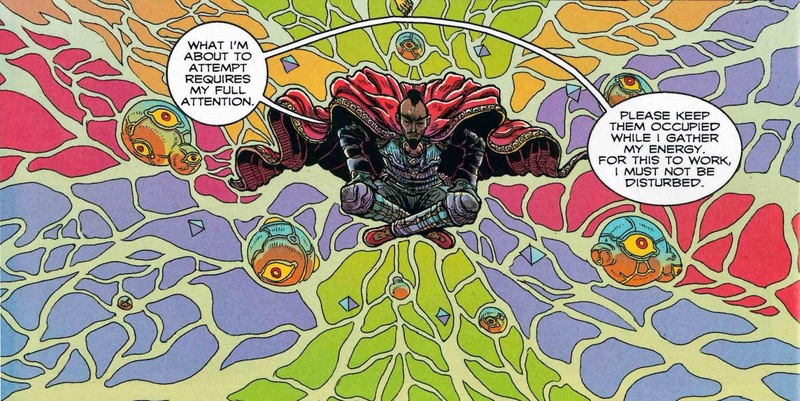 This one is lovely- Dr Strange, centred (you see what I did there), floating as he draws upon his powers to prepare for what he's about to do. It invokes a sense of serenity, despite the psychedelic and comsic implications. The softer tone is achieved by breaking up the rays so that they're not strong solid blocks of colour, and using slightly lighter shades. And my final pick: again the three Avengers centered at the top and everybody else at the bottom- this is almost another triangle shape. Those pops of red I talked about earlier come into play here, as they differentiate Starnge, Rogue, and Bill from all else. Also: giant turtle.